New and antique bells are available. Petal bells have an old-fashioned look with a cheery bright jingle. Soft gold color. Round ridge bells have the same shape as petal bells, but no "daisy" design. They sound similar to petal bells but tend to be a bit louder. Soft gold color. New solid-brass bells have a higher, louder sound than antique bells. They come in two finishes -- shiny gold or shiny silver. The leather bell strap is sized to fit a large man's hand and is stitched together for durability and good looks. All edges of the bell strap are rounded over for comfort and dyed to match the surface color. The leather "keeper" has two loops. Santa's belt slips through the sewn loop. The snapped loop slips through the bell strap and snaps to hold the bells securely. Sold per each. 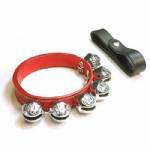 Made to order -- allow about 3 weeks for us to make this item using bells from our inventory. Lead time will be longer if using your bells.